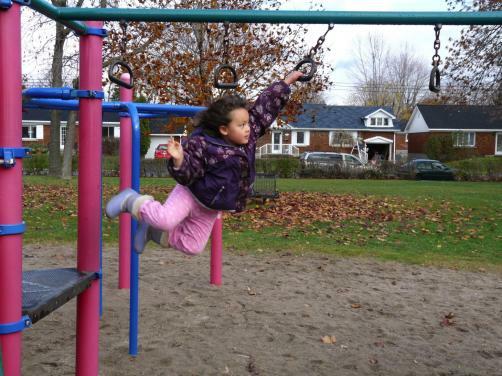 Conversations with a Pregnant Wife, Part 2: Watch Out, She’s Moody! The first three months represented one-sided arguments, morning sickness, and food cravings. The following three months of pregnancy are like a walking through a minefield, with more one-sided arguments and weight gain. The husband has to expect a lot of warning messages that reflect the pregnant wife’s mood, not helped by the fact that she has a career. Wife: See? As I told you before, you have to stop defending them. Wife: The meeting today! The attendees have not given me my prestige even though they knew about my pregnancy. Wife: Imagine, once I entered the meeting room, just five people stood up, and the others didn’t care. Husband: WHAT! You had the chance to choose between five seats! Wife: NO, all people have to stand up and let me choose where I want to sit. Wife: I’ll ask the manager to limit the meeting for three to four people max. ; a congested room is not good for my pregnancy. Husband: Why do you bother? You know, why don’t you ask him to cancel all meetings! Wife: Poor me, you’re always mean to me. Even one girl felt sorry for me and let me sit beside the window, and she opened the door too! Husband: That’s not fair for them. Wife: What! You’re worried about them and not me? Men! At this stage of pregnancy, all husbands have to learn how to control their temper and be patient. A little piece of advice for husbands: Don’t try to get involved in any arguments with your lovely, pregnant wife! It’s useless, as the argument will end with accusations as if you’re the reason for all the destruction and wars in the world! 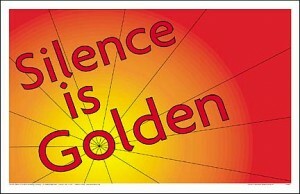 You have to learn that if speech is silver, then silence is solid gold. The fifth month means a lot of activity, so don’t be surprised if your wife starts to become more active and looks for extra work to do. As the baby starts growing, the pregnant wife starts getting less sleep and, normally, she won’t accept that you sleep while she doesn’t! Husbands, don’t be scared when your wife wakes you up in the middle of the night with a certain look on her face. In fact, the look is telling you something. Husband: What is it? What’s wrong? Are you sick? Did you hear something? Did someone call? Is there a thief in the house? Is there a fire in the neighborhood? Wife: No, nothing like that! I just wanted to tell you that I felt the baby move. Husband: (horrified) WHAAAAAT! You woke me up at — what time is it? – 3 a.m. to tell me that! I have to go to work early tomorrow morning, and I can feel the baby in the morning. Wife: (looking hurt) You don’t like me or our baby. I thought you’d like to share with me these moments. Husband: OK, OK, let me feel the baby. You can spend the rest of the night waiting to feel the baby move, which never happens! It’s normal. Simply, say you can feel it and make your life easier. The pregnant wife normally feels that she needs care and attention, so be ready to expect any weird request, at any time! Husband: Honey, I’ll take a nap until the food is ready. Wife: WHAT! You want to go and rest while I stand in the kitchen preparing food instead of coming to give me a hand? OK, your highness! Where is the UN, human rights organizations, and gender equity rules? Husband: OK, OK, I’m coming. I’ll give you a hand; sorry. Of course, your help will start by washing the raw vegetables, and you’ll end up preparing everything while your pregnant wife takes her nap! Wife: Honey, you can leave the dishes and I’ll put them in the dishwasher after I take a nap, but if you insist, it’s OK. Husband: (vexed) OK, honey, I’ll put them. Wife: Fine. Could you bring a glass of water with you. If you prepare tea for yourself, don’t forget my cup. Husband: Ummm, but you said you’ll take a nap! Wife: Yeah, I will after I drink my tea. While you’re waiting for the water to boil for the tea, please put the clothes in the washing machine. Plus, there are clothes that need to be folded. Can you do it? I’m very tired. To all husbands: Be careful of that word, “honey.” It’s usually followed by “do that” or “don’t do that”! With the sixth month comes the weight gain — around 15 kg in the beginning! The pregnant wife is forced to replace her normal clothes with larger sizes. She starts feeling the baby move, and gets disappointed with what she is beginning to look like. Wife: Why are you smiling like that? Haven’t you seen a pregnant woman gaining weight before? Husband: (trying to hold down his laughter) Of course not. You look the same, but why do you walk like that? Wife: I’m pregnant; have you forgotten or what? Husbands, don’t expect the lady you married to remain the same girl who likes to share in your thoughts and/or life difficulties. Their focus changes, and as pregnant women they always like to talk about the pregnancy, and they don’t intend or desire to talk about anything else. Wife: I read online that in the West pregnant women deliver their babies without anesthetics, and sometimes it happens when they’re sitting or swimming in a pool. I’ll check with my doctor to see about the possibility of doing the same. Husband: Honey, you’re still in your sixth month, and remember that you’re in Egypt, not in the West. Tell me first, do you spend all your working day searching for information about pregnancy on the Net? Sweetheart, I tell you what, let’s forget about that now, I need to eat. Wife: I’ll prepare something special today. Just go and sit in front of the TV until I finish. Husband: Honey, where’s the food? Wife: It’s not ready yet, it’s only 10 p.m., why are you in a hurry? Husband: Honey, you think 10 p.m. is still early? Let’s eat anything, even some cheese. Wife: (now mad) You’re a typical Middle Eastern man; there’s no appreciation whatsoever for my effort! Just for your information, my close friend never cooked anything throughout her pregnancy and up until four months after she delivered the baby. Husband: So what did they eat for the year? Wife: (in a low voice) Her husband was out of the country for a year, and she stayed at her parents’ house. A wise man once said that parents who failed to raise their son properly shouldn’t worry, the wife will certainly do the job! 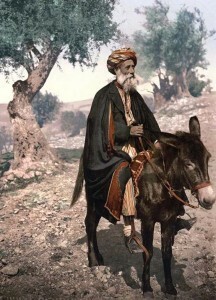 A Palestinian native of Bethlehem on his Donkey. This color photochrome print was created between 1890 and 1900 in West Bank. Again Goha felt embarrassed. He said, “Let’s ride together for a while.” So they both rode the donkey. Finally Goha decided that they would both walk, in order to give the donkey some rest. They both trudged along beside the donkey, the old man limping and the boy complaining that his feet hurt. As they passed a group of young men who were loitering and watching passers-by, one of the men exclaimed, “Look at those fools walking while they have a perfectly good donkey! Are they afraid of heights?” And all the young men laughed. The moral is clear: Altering your behavior to please other people is futile. No matter what you do, someone will always find fault. Do what you feel is right, and stick to it. 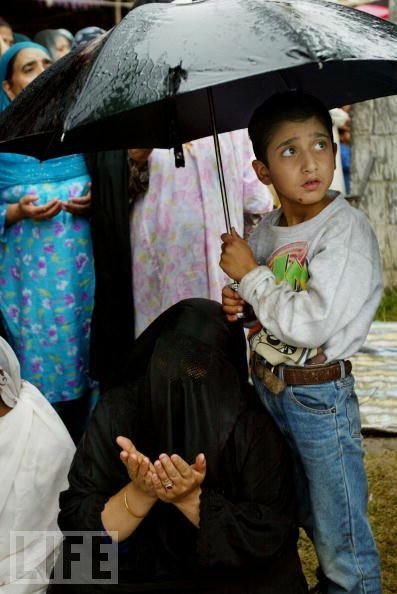 A young child holds an umbrella as Kashmiri Muslim pilgrims pray in the rain in Srinagar, Kashmir. Editor’s Note: Some call him Goha or Joha, the Turks call him Hodja, while the Perisans call him Mollah or Nasrullah. Regardless of what you call him, this wise, mysterious and sarcastic figure has been a fixture of Middle Eastern stories for centuries. There was a terrible drought. After a long deliberation, the villagers decided to approach Goha, who was known to work miracles on occasion, and ask for his intervention in bringing the rain. The whole community went over to Goha’s hut and the elders stated their request. “But Goha, how can you say that?” said the villagers. “After all, is it not our faith that brought us to your door, begging for help?